Most items are shipped via USPS, UPS Ground and FedEx Ground. Larger items may be shipped via the LTL freight carrier of Promotion Store’s choosing. The buyer is responsible for providing an address that these carriers recognize as a deliverable address. Unfortunately, we have no control over a shipment once a package departs the facilities. If there are any issues with delivery for reasons out of our control (address provided to us is not accurate, issues within the shipping company, etc.) we are not responsible for shipping delays. These instructions are typically included on the Bill of Lading (BOL), which is the document included with the shipment that indicates the shipping address, quantity, general product description, and the freight carrier’s contact information. When a shipment is delivered, both you and the truck driver will sign the BOL and you will be given a copy, which is your receipt of delivery. Please save your copy in the event a freight claim needs to be filed. Liftgate delivery - truck will have the ability to lower the pallet down to the ground, so you don’t have to manually lift it out of the truck. The height of truck bed from the ground is approximately 4.5 feet, which can make it difficult to manually lift heavy items out and off the truck. Don’t risk a back injury just to save a little bit of money. If lift gate delivery was requested and the truck does not have a liftgate at the time of the delivery, please notify the driver that lift gate delivery is required and refuse the delivery. Then contact customer service so we can follow up with the freight carrier and find out when the delivery will be attempted again with a proper lift gate truck. Call Ahead - the freight carrier will call before making delivery. They can call the day before or a couple of hours before delivery. If you have a preference for when the notification happens, please indicate at the time of order. Please include a contact name and phone number. Appointment Required - the freight carrier will call you and schedule a day and a window of time to make the delivery after the shipment has arrived at the local freight terminal. Let us know at the time of order if a delivery appointment is required and we will include that information on the bill of lading. Please include a contact name and phone number. Job Site Delivery - the delivery location is under construction and/or there is not receiving staff ready to receive the shipment. This also applies in the event that there is difficulty reaching the site with a standard sized truck and a smaller truck is required. Also indicate if lift gate delivery is required. Please include a contact name and phone number. Secured/Limited Access - If the freight truck driver is not able to drive and backup directly to the unloading area at the delivery location, the delivery is considered as “Secured/Limited Access.” For example, if there is a security gate that the driver must stop at before accessing the delivery location. The freight carrier will charge a fee in addition to the standard freight rate. This accessorial is frequently needed for government and military facilities. If you aren’t sure if it applies to your location, please contact customer service for more information. University/School Delivery - Freight delivery to Colleges, Universities, Trade Schools, High Schools, etc. will have an added fee. Please also indicate if lift gate delivery is required. Mine Delivery - Delivery to Mines, Dams, Ski Resorts or other remote locations will require an added fee. If you are unsure if this applies to your location, please contact customer service before ordering. Inside Delivery - The freight carrier will deliver, unpack and move the shipment to the first floor of your location. If it needs to be moved up stairs or to other floors, an additional fee will be charged. Please contact customer service to obtain a quote before placing the order. Please indicate if lift gate delivery is also required. Residential Delivery - Delivery to residential or areas that are not accessible by a standard size freight truck (approx. 53 ft long) will require the shipment to be delivered with a shorter, more maneuverable truck. Also indicate if you need lift gate delivery, which is typically also necessary for residential deliveries. The shipment will be placed at the curb or the nearest flat area at the end of the driveway. If you need the delivery to be moved any further, an additional fee will be charged. To avoid the residential delivery fee, you can arrange to pick up the shipment at the nearest freight terminal instead. You would be responsible for moving the shipment with your vehicle to the destination. Please contact customer service for more details about this special shipping option. Accessorial fees can range in cost from $25.00 - $125.00 each. Fees vary by freight carrier, location and delivery requirements. Any special delivery services need to be requested at the time of order. If they are requested after the order has shipped, you will be billed for the extra charges. If the freight truck driver tries to make the delivery but is turned away for any reason, there will be a re-delivery fee charged plus the accessorial fee if a special delivery service is required. The more information that is communicated about the delivery location at the time of the order the better. The freight carrier is more accommodating to special requests before a delivery is attempted than after the fact. Freight shipments must be shipped to the address listed on the bill of lading. Count, Open & Inspect entire contents BEFORE signing for the shipment! 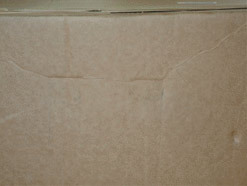 If the boxes look damaged, note damaged items and/or shortages on the delivery receipt. REFUSE any damaged goods. Failure to note damages/shortages at the time of delivery releases Promotion Store LLC from all liability; therefore, you are responsible for any replacement costs. Damage that is found after the driver has left and was not notated on the delivery receipt is concealed damage. Replacement costs will apply on all concealed damages. It is your responsibility to inspect the entire shipment before the driver leaves. Failure to do so releases Promotion Store LLC from all liability. If concealed damaged is discovered Promotion Store LLC must be notified within 24 hours of delivery (excluding weekends). We require that all original packaging materials including the carton and any foam contained therein be retained until we advise you it may be discarded. You are encouraged to take photographs of the outer and inner packaging as well as the damaged product. We will repair or ship a replacement as soon as possible to you. 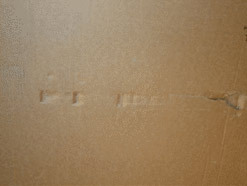 The following pictures illustrate what concealed damage looks like. Figure 1 and 2 is of the outside of the carton. 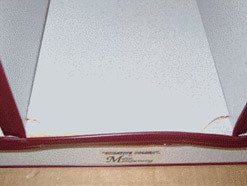 Although the damage appears to be minimal on the box, the inner contents of the package are severely damaged (figure 3 and 4). Creases, dents, tears and punctures are all considered damage and should always be notated on the delivery receipt. Every package should be opened and inspected before the driver leaves. If you signed for the carton without notating any damage on the delivery receipt, you have signed the goods as “Free and Clear.” A notation of “Subject to Inspection” or “Possible Damage” on the delivery receipt is not acceptable and is viewed the same as if it were signed clear. If damage is not specifically notated on the delivery receipt, the delivering freight line will not accept responsibility for the damage. That means that we will not be reimbursed for the damaged merchandise and freight charges; therefore, we cannot provide replacements to you free of charge. You will be responsible for any replacement costs. We advise all dealers and end users to carefully read our policies which contain information on what to do if your shipment is damaged and outlines our procedures for resolving the situation. Our policies are directly impacted by freight companies as we have to follow their rules and regulations when submitting a damage claim. 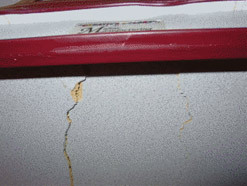 Damages that occur in transit are unfortunate and we do sincerely apologize. Our guidelines are in place to protect everyone involved and help to expedite the process of sending replacements as quickly as possible. All freight companies allow a specific amount of time for you to inspect your shipment before the driver leaves, generally 10-30 minutes. The time limits are based on the total weight of your shipment. If the driver refuses to wait, then you must call Promotion Store LLC immediately and contact your local delivering terminal. The time limitations are listed below for Promotion Store LLC preferred freight carriers. Damages that occur in transit are unfortunate. Our policies are in place to expedite the process of sending replacements or repairing as quickly as possible. Please, do not hesitate to call if you have any questions regarding our policy on accepting freight shipments: 1-800-573-3111. If you have any questions regarding this or other policies, please call 1-800-573-3111 or e-mail Support@PromotionStore.com.